Blood alcohol content (BAC), also called blood alcohol concentration, blood ethanol concentration, or blood alcohol level, is most commonly used as a metric of alcohol intoxication for legal or medical purposes. Blood alcohol concentration is usually expressed as a percentage of ethanol in the blood in units of mass of alcohol per volume of blood or mass of alcohol per mass of blood, depending on the country. For instance, in North America a BAC of 0.10 (0.10% or one tenth of one percent) means that there are 0.10 g of alcohol for every 100 mL of blood. DP is the drinking period in hours. Regarding metabolism (MR) in the formula; females demonstrated a higher average rate of elimination (mean, 0.017; range, 0.014–0.021 g/210 L) than males (mean, 0.015; range, 0.013–0.017 g/210 L). Female subjects on average had a higher percentage of body fat (mean, 26.0; range, 16.7–36.8%) than males (mean, 18.0; range, 10.2–25.3%). Additionally, men are, on average, heavier than women but it is not strictly accurate to say that the water content of a person alone is responsible for the dissolution of alcohol within the body, because alcohol does dissolve in fatty tissue as well. When it does, a certain amount of alcohol is temporarily taken out of the blood and briefly stored in the fat. For this reason, most calculations of alcohol to body mass simply use the weight of the individual, and not specifically his/her water content. Finally, it is speculated that the bubbles in sparkling wine may speed up alcohol intoxication by helping the alcohol to reach the bloodstream faster. Note: This chart defines a drink as 14 g of ethanol, while the formula defines a drink as 10 g of ethanol. The National Institute on Alcohol Abuse and Alcoholism (NIAAA) define the term "binge drinking" as a pattern of drinking that brings a person’s blood alcohol concentration (BAC) to 0.08 grams percent or above. This typically happens when men consume 5 or more drinks, and when women consume 4 or more drinks, in about 2 hours. There are several different units in use around the world for defining blood alcohol concentration. Each is defined as either a mass of alcohol per volume of blood or a mass of alcohol per mass of blood (never a volume per volume). 1 milliliter of blood has a mass of approximately 1.06 grams. Because of this, units by volume are similar but not identical to units by mass. In the U.S. the concentration unit 1% w/v (percent mass/volume, equivalent to 10 g/l or 1 g per 100 ml) is in use. This is not to be confused with the amount of alcohol measured on the breath, as with a breathalyzer. The amount of alcohol measured on the breath is generally accepted as proportional to the amount of alcohol present in the blood at a rate of 1:2100. Therefore, a breathalyzer measurement of 0.10 mg/L of breath alcohol converts to 0.0001×2100 g/10dL, or 0.021 g/dL of blood alcohol (the units of the BAC in the United States). While a variety of units (or sometimes lack thereof) is used throughout the world, many countries use the g/L unit, which does not create confusion as percentages do. Usual units are highlighted in the table below. 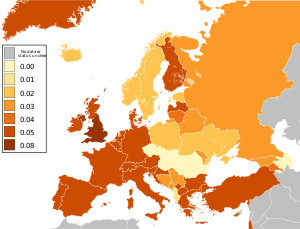 Map of Europe showing countries' blood alcohol limits as defined in g/dl for the general population. For purposes of law enforcement, blood alcohol content is used to define intoxication and provides a rough measure of impairment. Although the degree of impairment may vary among individuals with the same blood alcohol content, it can be measured objectively and is therefore legally useful and difficult to contest in court. Most countries disallow operation of motor vehicles and heavy machinery above prescribed levels of blood alcohol content. Operation of boats and aircraft is also regulated. The alcohol level at which a person is considered legally impaired varies by country. The list below gives limits by country. These are typically blood alcohol content limits for the operation of a vehicle. It is illegal to have any measurable alcohol in the blood while driving in these countries. Most jurisdictions have a tolerance slightly higher than zero to account for false positives and naturally occurring alcohol in the body. Some of the following jurisdictions have a general prohibition of alcohol. Canada—new drivers undergoing graduated licensing in Ontario, British Columbia, Newfoundland and Labrador and Alberta; drivers under the age of 22 in Manitoba, New Brunswick, Northwest Territories, Nova Scotia, Ontario, Saskatchewan and in Quebec receive a 30-day suspension and 7-day vehicle seizure. Drivers in Alberta who are in the graduated licensing program, regardless of age, are subject to the same 30-day/7-day suspensions/seizure policy. Japan—drivers under the age of 20 because of not reaching legal drinking age. New Zealand—drivers under the age of 20; drivers convicted of excess breath alcohol may be required to gain a zero-limit license. Romania—beyond 0.08% drivers will not only receive a fine and have their license suspended, the offense will also be added to their criminal records. Norway (road vehicles and sea vessels over 15 m), alternatively 0.1 mg/L of breath. United States—drivers under the age of 21 may have up to 0.02%, on the federal level, however most states have Zero Tolerance laws emplaced. Canada: Alberta, British Columbia, Ontario, Manitoba, Newfoundland, Nova Scotia, New Brunswick—provincial offence. Drivers have not committed a criminal offense, however a 3-day licence suspension and 3-day vehicle seizure occurs. Israel: 24 µg per 100 ml (0.024%) of breath (penalties only apply above 26 µg per 100 ml (0.026%) of breath due to lawsuits about sensitivity of devices used). This is equivalent to a BAC of 0.05. New drivers, drivers under 24 years of age and commercial drivers 5 µg per 100 ml of breath. This is equivalent to a BAC of 0.01. Portugal: 0.02% for drivers holding a driver's licence for less than three years, professional drivers, and drivers of taxis, heavy vehicles, emergency vehicles, public transport of children and carrying dangerous goods. Slovenia: 0.00% for drivers in their first two years after gaining a drivers licence, drivers under 21 and professional drivers, such as buses, trucks. Northern Ireland: The government of Northern Ireland intends to reduce the general limit to 0.05%. United States: All states impose penalties for driving with a BAC of 0.08% or greater. Even below those levels drivers can have civil liability and other criminal guilt (e.g., in Arizona driving impairment to any degree caused by alcohol consumption can be a civil or criminal offense in addition to other offenses at higher blood alcohol content levels). Drivers under 21 (the most common U.S. legal drinking age) are held to stricter standards under zero tolerance laws adopted in varying forms in all states: commonly 0.01% to 0.05%. See Alcohol laws of the United States by state. Federal Motor Carrier Safety Administration: 0.04% for drivers of a commercial vehicle requiring a commercial driver's license and 0.01% for operators of common carriers, such as buses. In certain countries, alcohol limits are determined by the breath alcohol content (BrAC), not to be confused with blood alcohol content (BAC). In Greece, the BrAC limit is 250 micrograms of alcohol per litre of breath. The limit in blood is 0.50 g/l. The BrAC limit for drivers in their first two years after gaining a driving license and common carriers are more restricted to 100 micrograms per litre of breath. BrAC 250–400 = €200 fine. In The Netherlands and Finland, the BrAC limit is 220 micrograms of alcohol per litre of breath (μg/l, colloquially known as "Ugl"). In New Zealand, the BrAC limit is 250 micrograms of alcohol per litre of breath for those aged 20 years or over, and zero (meaning illegal to have any measurable breath alcohol content) for those aged under 20 years. In Singapore, the BrAC limit is 350 micrograms of alcohol per litre of breath. In Spain the BrAC limit is 250 micrograms of alcohol per litre of breath and 150 micrograms per litre of breath for drivers in their first two years after gaining a driving license and common carriers. In England and Wales the BrAC limit is 350 micrograms of alcohol per litre of breath (as well as the above defined blood alcohol content). In Scotland the BrAC limit is 220 micrograms of alcohol per litre of breath (as well as the above defined blood alcohol content). In Trinidad and Tobago the BrAC limit is 35 micrograms of alcohol per 100 millilitres of breath (as well as the above defined blood alcohol content). Blood alcohol tests assume the individual being tested is average in various ways. For example, on average the ratio of blood alcohol content to breath alcohol content (the partition ratio) is 2100 to 1. In other words, there are 2100 parts of alcohol in the blood for every part in the breath. However, the actual ratio in any given individual can vary from 1300:1 to 3100:1, or even more widely. This ratio varies not only from person to person, but within one person from moment to moment. Thus a person with a true blood alcohol level of .08% but a partition ratio of 1700:1 at the time of testing would have a .10 reading on a Breathalyzer calibrated for the average 2100:1 ratio. Alcohol is absorbed throughout the gastrointestinal tract, but more slowly in the stomach than in the small or large intestine. For this reason, alcohol consumed with food is absorbed more slowly, because it spends a longer time in the stomach. Furthermore, alcohol dehydrogenase is present in the stomach lining. After absorption, the alcohol passes to the liver through the hepatic portal vein, where it undergoes a first pass of metabolism before entering the general bloodstream. Alcohol is removed from the bloodstream by a combination of metabolism, excretion, and evaporation. Alcohol is metabolized mainly by the group of six enzymes collectively called alcohol dehydrogenase. These convert the ethanol into acetaldehyde (an intermediate more toxic than ethanol). The enzyme acetaldehyde dehydrogenase then converts the acetaldehyde into non-toxic acetic acid. Such persons have impaired acetaldehyde dehydrogenase, which causes acetaldehyde levels to peak higher, producing more severe hangovers and other effects such as flushing and tachycardia. Conversely, members of certain ethnicities that traditionally did not use alcoholic beverages have lower levels of alcohol dehydrogenases and thus "sober up" very slowly, but reach lower aldehyde concentrations and have milder hangovers. Rate of detoxification of alcohol can also be slowed by certain drugs which interfere with the action of alcohol dehydrogenases, notably aspirin, furfural (which may be found in fusel alcohol), fumes of certain solvents, many heavy metals, and some pyrazole compounds. Also suspected of having this effect are cimetidine (Tagamet), ranitidine (Zantac), and acetaminophen (Tylenol) (paracetamol). Currently, the only known substance that can increase the rate of metabolism of alcohol is fructose. The effect can vary significantly from person to person, but a 100 g dose of fructose has been shown to increase alcohol metabolism by an average of 80%. Fructose also increases false positives of high BAC ratio readings in anyone with proteinuria and hematuria, due to kidney-liver metabolism. Alcohol absorption can be slowed by ingesting alcohol on a full stomach. The belief that the food absorbs the alcohol is a common misconception. Alcohol absorption is slowed because the stomach sphincter closes in order to break down the food. The alcohol cannot be absorbed through the stomach, thus cannot be absorbed until the sphincter is opened and the consumed alcohol can flow to the small intestine. Alcohol in carbonated beverages is absorbed faster than alcohol in non-carbonated drinks. Being under stress causes alcohol to metabolize faster. Retrograde extrapolation is the mathematical process by which someone's blood alcohol concentration at the time of driving is estimated by projecting backwards from a later chemical test. This involves estimating the absorption and elimination of alcohol in the interim between driving and testing. The rate of elimination in the average person is commonly estimated at .015 to .020 grams per deciliter per hour (g/dl/h), although again this can vary from person to person and in a given person from one moment to another. Metabolism can be affected by numerous factors, including such things as body temperature, the type of alcoholic beverage consumed, and the amount and type of food consumed. In an increasing number of states, laws have been enacted to facilitate this speculative task: the blood alcohol content at the time of driving is legally presumed to be the same as when later tested. There are usually time limits put on this presumption, commonly two or three hours, and the defendant is permitted to offer evidence to rebut this presumption. In 1982, a 24-year-old woman was admitted to the UCLA emergency room with a serum alcohol content of 1.51%, corresponding to a BAC of 1.33%. She was alert and oriented to person and place. Serum alcohol concentration is not equal to nor calculated in the same way as blood alcohol content. In 1984, a 30-year-old man survived a blood alcohol concentration of 1.5% after vigorous medical intervention that included dialysis and intravenous therapy with fructose. In 1995, a man from Rzeszów, Poland, caused a car accident near his hometown. He had a blood alcohol content of 1.48% ; he was tested five times but all results were the same. He died a few days later of injuries from the accident. In 2004, an unidentified Taiwanese woman died of alcohol intoxication after immersion for twelve hours in a bathtub filled with 40% ethanol. Her blood alcohol content was 1.35%. It was believed that she had immersed herself as a response to the SARS epidemic. In South Africa, a man driving a Mercedes-Benz Vito light van containing 15 sheep allegedly stolen from nearby farms was arrested on December 22, 2010, near Queenstown in Eastern Cape. His blood had an alcohol content of 1.6%. Also in the vehicle were five boys and a woman, who were also arrested. On 26 October 2012, a man from Gmina Olszewo-Borki, Poland, who died in a car accident, recorded a blood alcohol content of 2.23%; however, the blood sample was collected from a wound and thus possibly contaminated. On 26 July 2013 a 40-year-old man from Alfredówka, Poland, was found by Municipal Police Patrol from Nowa Dęba lying in the ditch along the road in Tarnowska Wola. At the hospital, it was recorded that the man had a blood alcohol content of 1.374%. The man survived. ^ a b Andersson, Agneta; Wiréhn, Ann-Britt; Ölvander, Christina; Ekman, Diana; Bendtsen, Preben (2009). "Alcohol use among university students in Sweden measured by an electronic screening instrument". BMC Public Health. 9: 229. doi:10.1186/1471-2458-9-229. PMC 2724514. PMID 19594906. ^ Cowan, J. M.; Weathermon, A.; McCutcheon, J. R.; Oliver, R. D. (1 September 1996). "Determination of Volume of Distribution for Ethanol in Male and Female Subjects". Journal of Analytical Toxicology. 20 (5): 287–290. doi:10.1093/jat/20.5.287. PMID 8872236. ^ "Quick Stats: Binge Drinking." The Centers for Disease Control and Prevention. April 2008..
^ "The Various Alcohol and Drug Related Prohibitions and Suspensions – Prohibitions and Suspensions – RoadSafetyBC". ^ Alberta, Government of (2011-11-16). "Alberta's approach to impaired driving". www.transportation.alberta.ca. Retrieved 2018-09-24. ^ "Newsroom : Keeping Drivers Safe". news.ontario.ca. ^ "Tolérance zéro pour les conducteurs de moins de 21 ans". La Presse. ^ "Alberta Zero Alcohol Tolerance Program (Graduated Driver's Licence)" (PDF). ^ "Tolerancia cero: ni una cerveza si va a conducir". eltiempo.com. 2013-12-21. ^ a b "Alcohol and Driving". Ministry of Transport. Retrieved 2 July 2012. ^ "Medvedev signs total drink driving ban". RIAN. 2010-07-23. ^ a b "Russian drivers to be allowed to have slight alcohol content in blood". Itar-tass. 2013-07-26. ^ "Alcohol cero rige a partir de 2016". ^ a b "Alcohol". 2009-12-11. ^ According to Section 185 of Motor Vehicles Act 1988. On first offence, the punishment is imprisonment of six months and/or fine of 2000 Indian rupees (INR). If the second offence is committed within three years, the punishment is two years and/or fine of 3000 Indian Rupees (INR). The clause of 30 mg/dL was added by an amendment in 1994. It came into effect beginning 14 November 1994. ^ http://www.npa.go.jp/policies/application/license_renewal/pdf/english.pdf The breath alcohol concentration limit for driving in Japan is 0.15 mg/l, which, assuming a breath alcohol to blood alcohol ratio of 1:2,100, is roughly equivalent to a BAC of 0.0315%. The penalties become even more severe at 0.25 mg/l, which is roughly equivalent to a BAC of 0.0525%. ^ "Dáil agrees to reduce drink-drive limit". Rte.ie. 2010-06-24. ^ "The Mauritius Police Force - Safety Driving". ^ "BAC and BrAC Limits – International Alliance for Responsible Drinking". International Alliance for Responsible Drinking. ^ "Drink-drive limit in Scotland - mygov.scot". www.mygov.scot. Retrieved 2018-08-20. ^ "Quoi de neuf en 2014 ?". Archived from the original on 2014-01-16. ^ "Driving Under the Influence Unit". ^ "The drink drive limit". ^ National Institute of Alcohol Abuse and Alcoholism. http://alcoholpolicy.niaaa.nih.gov/Blood_Alcohol_Concentration_Limits_Adult_Operators_of_Noncommercial_Motor_Vehicles.html. Accessed on February 01, 2013. ^ "Commercial Driver's License Program". Federal Motor Carrier Safety Administration. 2014-01-02. ^ "18 U.S.C. § 343: US Code – Section 343: Presumptions". Findlaw. ^ "Alcohol and drug limits". Driving Tests Resources. 2014-07-25. ^ Alobaidi TA, Hill DW, Payne JP (1976). "Significance of variations in blood: breath partition coefficient of alcohol". Br Med J. 2 (6050): 1479–81. doi:10.1136/bmj.2.6050.1479. PMC 1689868. PMID 793681. ^ Alan J.Buglass, ed. (2011). Handbook of alcoholic beverages : technical, analytical and nutritional aspects. Chichester: Wiley. ISBN 978-0-470-97665-4. Retrieved 6 July 2013. ^ Thomasson, Holly R. (2002). "Gender Differences in Alcohol Metabolism". Recent Developments in Alcoholism. 12. pp. 163–72. doi:10.1007/0-306-47138-8_9. ISBN 978-0-306-44921-5. Carpenter, Thorne M.; Lee, Robert C (1937). "The effect of fructose on the metabolism of ethyl alcohol in man". Journal of Pharmacology and Experimental Therapeutics. 60 (3). Retrieved 23 June 2016. Tygstrup, Niels; Winkler, Kjeld; Lundquist, Frank (1 May 1965). "The Mechanism of the Fructose Effect on the Ethanol Metabolism of the Human Liver*". Journal of Clinical Investigation. 44 (5): 817–830. doi:10.1172/JCI105194. PMC 292558. PMID 14276139. Patel, AR; Paton, AM; Rowan, T; Lawson, DH; Linton, AL (August 1969). "Clinical studies on the effect of laevulose on the rate of metabolism of ethyl alcohol". Scottish Medical Journal. 14 (8): 268–71. doi:10.1177/003693306901400803. PMID 5812044. Lowenstein, LM; Simone, R; Boulter, P; Nathan, P (14 September 1970). "Effect of fructose on alcohol concentrations in the blood in man". JAMA. 213 (11): 1899–901. doi:10.1001/jama.1970.03170370083021. PMID 4318655. Pawan, GL (September 1972). "Metabolism of alcohol (ethanol) in man". The Proceedings of the Nutrition Society. 31 (2): 83–9. doi:10.1079/pns19720020. PMID 4563296. Thieden, HI; Grunnet, N; Damgaard, SE; Sestoft, L (October 1972). "Effect of fructose and glyceraldehyde on ethanol metabolism in human liver and in rat liver". European Journal of Biochemistry / FEBS. 30 (2): 250–61. doi:10.1111/j.1432-1033.1972.tb02093.x. PMID 4145889. Soterakis, J; Iber, FL (March 1975). "Increased rate of alcohol removal from blood with oral fructose and sucrose". The American Journal of Clinical Nutrition. 28 (3): 254–7. doi:10.1093/ajcn/28.3.254. PMID 1119423. Rawat, AK (February 1977). 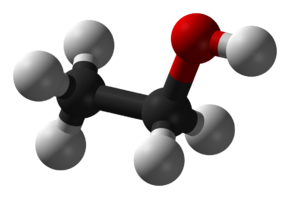 "Effects of fructose and other substances on ethanol and acetaldehyde metabolism in man". Research Communications in Chemical Pathology and Pharmacology. 16 (2): 281–90. PMID 847286. Iber, FL (September 1977). "The effect of fructose on alcohol metabolism". Archives of Internal Medicine. 137 (9): 1121. doi:10.1001/archinte.137.9.1121. PMID 901079. Bode, JC; Bode, C; Thiele, D (1 February 1979). "Alcohol metabolism in man: effect of intravenous fructose infusion on blood ethanol elimination rate following stimulation by phenobarbital treatment or chronic alcohol consumption". Klinische Wochenschrift. 57 (3): 125–30. doi:10.1007/bf01476052. PMID 439778. Sprandel, U; Tröger, HD; Liebhardt, EW; Zöllner, N (1980). "Acceleration of ethanol elimination with fructose in man". Nutrition and Metabolism. 24 (5): 324–30. doi:10.1159/000176278. PMID 7443107. Meyer, BH; Müller, FO; Hundt, HK (6 November 1982). "The effect of fructose on blood alcohol levels in man". South African Medical Journal (Suid-Afrikaanse Tydskrif Vir Geneeskunde). 62 (20): 719–21. PMID 6753183. Crownover, BP; La Dine, J; Bradford, B; Glassman, E; Forman, D; Schneider, H; Thurman, RG (March 1986). "Activation of ethanol metabolism in humans by fructose: importance of experimental design". The Journal of Pharmacology and Experimental Therapeutics. 236 (3): 574–9. PMID 3950864. Mascord, D; Smith, J; Starmer, GA; Whitfield, JB (1991). "The effect of fructose on alcohol metabolism and on the [lactate]/[pyruvate] ratio in man". Alcohol and Alcoholism. 26 (1): 53–9. PMID 1854373. Onyesom, I; Anosike, EO (June 2004). "Oral fructose-induced changes in blood ethanol oxidokinetic data among healthy Nigerians". The Southeast Asian Journal of Tropical Medicine and Public Health. 35 (2): 476–80. PMID 15691159. Uzuegbu, UE; Onyesom, I (June 2009). "Fructose-induced increase in ethanol metabolism and the risk of Syndrome X in man". Comptes Rendus Biologies. 332 (6): 534–8. doi:10.1016/j.crvi.2009.01.007. PMID 19520316. ^ a b c "Absorption Rate Factors". BHS.UMN.edu. Archived from the original on 18 January 2013. When food is ingested, the pyloric valve at the bottom of the stomach will close in order to hold food in the stomach for digestion and thus keep the alcohol from reaching the small intestine. The larger the meal and closer in time to drinking, the lower the peak of alcohol concentration; some studies indicate up to a 20% reduction in peak blood alcohol level. Stress causes the stomach to empty directly into the small intestine, where alcohol is absorbed even faster. Liquor mixed with soda or other bubbly drinks speeds up the passage of alcohol from the stomach to the small intestine, which increases the speed of absorption. ^ Holt S (1 February 1981). "Observations on the relation between alcohol absorption and the rate of gastric emptying". Can Med Assoc J. 124 (3): 267–77, 297. PMC 1705129. PMID 7459787. ^ LEIKOLA A (1962). "Influence of stress on alcohol intoxication in rats". Q J Stud Alcohol. 23: 369–75. PMID 13929435. ^ Montgomery, Mark R.; Reasor, Mark J. (1992). "Retrograde extrapolation of blood alcohol data: An applied approach". Journal of Toxicology and Environmental Health. 36 (4): 281–92. doi:10.1080/15287399209531639. PMID 1507264. ^ Johnson, R (1982). "Survival After a Serum Ethanol Concentration of 11/2%". The Lancet. 320 (8312): 1394. doi:10.1016/S0140-6736(82)91285-5. ^ Labianca, Dominick A. (2002). "Conversion of Serum-Alcohol Concentrations to Corresponding Blood-Alcohol Concentrations". Journal of Chemical Education. 79 (7): 803. Bibcode:2002JChEd..79..803L. doi:10.1021/ed079p803. ^ O'Neill, Shane; Tipton, KF; Prichard, JS; Quinlan, A (1984). "Survival After High Blood Alcohol Levels: Association with First-Order Elimination Kinetics". Archives of Internal Medicine. 144 (3): 641–2. doi:10.1001/archinte.1984.00350150255052. PMID 6703836. ^ a b Łuba, Marcin (24 October 2012). "Śmiertelny rekord: Kierowca z powiatu ostrołęckiego miał 22 promile alkoholu! Zginął w wypadku". eOstroleka.pl (in Polish). Retrieved 2017-11-04. ^ Wu, Yen-Liang; Guo, How-Ran; Lin, Hung-Jung (2005). "Fatal alcohol immersion during the SARS epidemic in Taiwan". Forensic Science International. 149 (2–3): 287. doi:10.1016/j.forsciint.2004.06.014. PMID 15749375. Carnegie Library of Pittsburgh. Science and Technology Department. The Handy Science Answer Book. Pittsburgh: The Carnegie Library, 1997. ISBN 978-0-7876-1013-5. Perham, Nick; Moore, Simon C.; Shepherd, Jonathan; Cusens, Bryany (2007). "Identifying drunkenness in the night-time economy". Addiction. 102 (3): 377–80. doi:10.1111/j.1360-0443.2006.01699.x. PMID 17298644. Taylor, L., and S. Oberman. Drunk Driving Defense, 6th edition. New York: Aspen Law and Business, 2006. ISBN 978-0-7355-5429-0. Wikimedia Commons has media related to Blood alcohol content statistics. This page was last edited on 7 April 2019, at 21:52 (UTC).